Above: Maya stela at Copan by Frederick Catherwood. Blogging on an Ipad on a bus racing through the Yucatan can be difficult. For one thing, I can’t insert links. Also, I haven’t been in WiFi range for a day. Last night I slept at the Hacienda Uxmal, the same hacienda where the great English illustrator Frederick Catherwood stayed when he drew the Uxmal ruins in 1839. There is a bilingual plaque on the hacienda’s wall saying Catherwood ‘died at the height of his career in a sink on the steamship Artic’ traveling from Liverpool to New York. Imagine that! Reading the Spanish version I understood the entire ‘barca de vapor’ or steamship did sink, so his death was slightly less proposterous than I originally thought. 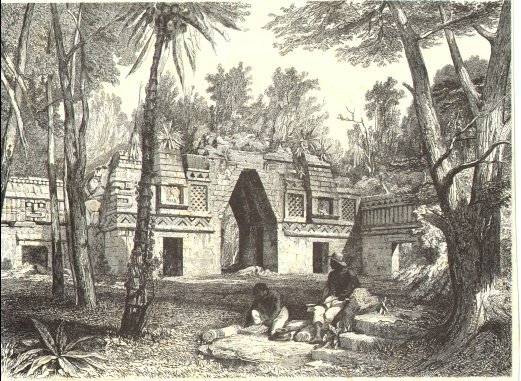 Arch at Labna, by Frederick Catherwood. Update: Back on campus, I’ve added links to Smith College’s splendid online gallery of his artwork. Here is more from Casa Catherwood, in Merida. The stela at the top of the page is a chromolithograph. His black and white work is also worth checking out. Much of the Maya art and architecture Catherwood drew in 1839 has since been looted, vandalized, or otherwise destroyed. Fortunately, his drawings are so precise that epigraphers, folks who read Maya glyphs, can decipher much of what he documented. 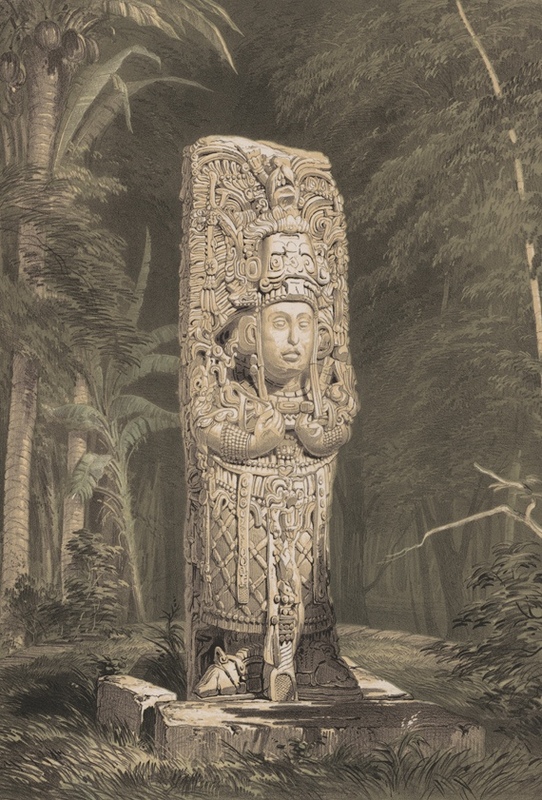 With today’s upswing in interest in all things Maya, Catherwood’s work is collectable again. 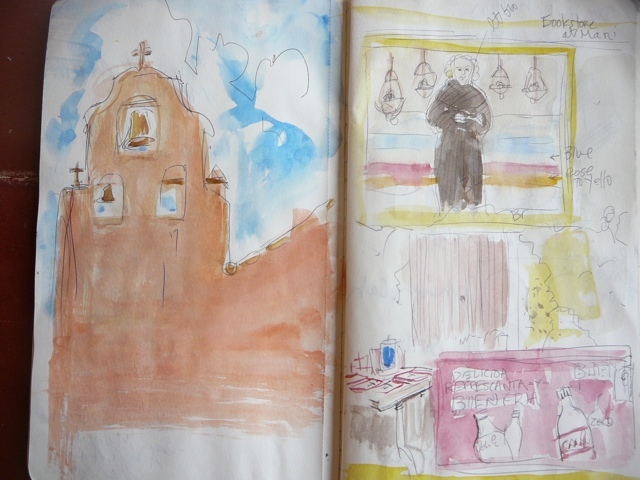 Above: my sketchbook page showing the church at Mani and its bookstore. Speaking of Books and the Yucatan…. Yesterday we were at the 16th century Franciscan Church at Mani. It is a massive structure with a fresh coat of burnt orange paint on its simple face. I knelt in church and said a quick prayer, asking for the impossible. Then I went into the little bookstore attached to the church. They had framed Virgens de Guadalupe printed on silver foil. Hecho en China, made in China, they cost 30 pesos, under 3 dollars. Somewhere between the Ipad factory and the bobble-head ballplayer plant, there must be a blessed printing press reproducing Mexico’s protectress. There was a colonial-era portrait mural of a Franciscan friar on the wall above the rosaries. Below the rosaries rested a horizontal fridge full of ice cold Coca-Cola. There was a large selection of little books. Even though Maya language radio could be heard in the village, all the books were in Spanish. These seemed to be printed in Mexico. Some of the titles were fascinating, like The Seven Fortresses of Sobriety, and Que Falte Nadie en Cielo, roughly translated, In Heaven, You’ll Miss Nothing! I resisted the temptation to buy any book in this particular bookshop. This is where Friar Diego de Landa burned every Maya book he could find in 1562. Nobody knows how much science, history, and art de Landa’s bonfire destroyed. Amara Solari, Penn State art historian, estimates the friar burned between one and two hundred books at Mani. She says the book burning didn’t end there. It continued into the 17th century. De Landa reported Maya elders appeared ‘distraught’ to see their sacred books go up in flames. Only 4 Maya books survived, some because they had been shipped to Europe prior to this book burning of 1562. The Maya codices were not like our books, exactly. They were hand-painted manuscripts, one-of-a-kind objects. While the Maya may have reproduced images on fabric and pottery with simple printing devices like rubber stamps, they never made the leap to printing on paper. On the other hand, Catherwood’s books on the Maya were printed in runs of 10,000 at a time. His illustrations appeared in the bestselling travel book of his day. Still, it seems to me, collecting individual leaves resulting from the destruction of a rare book, is a terrible thing. Dear God, thank you for the fact I have no WiFi, at this moment, when I am tempted to buy a print by Frederick Catherwood. < Previous Something Craig Frazier taught me. Next > Jean Charlot, an illustrator worth knowing.